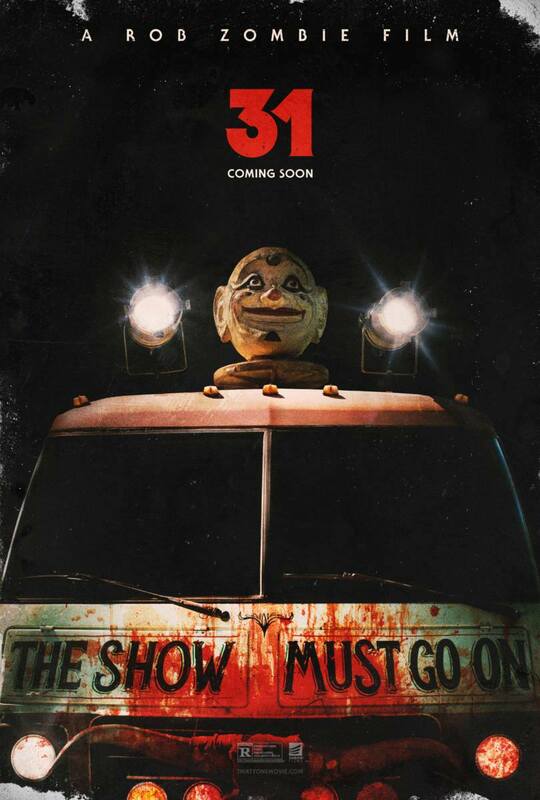 ROB ZOMBIE’S “31” GETS A NEW TRAILER! Fans of Rob Zombie and his flicks have been chomping at the bit for a trailer for his new Halloween set horror “31”. Now that moment has gruesomely arrived! “31” is due out 9/16/16! EPIC NEWS FOR THE HALLOWEEN FRANCHISE! If it wasn’t enough to hear great news this morning that horror factory Blumhouse, Trancas International Films and Mirimax are bringing us a new Halloween flick, they also have convinced the master himself John Carpenter to return to the franchise to executive produce and possibly score, as well. Now the great folks over at Bloody Disgusting.com have broken news that Absentia, Oculus, Hush director Mike Flanagan is in talks to direct! 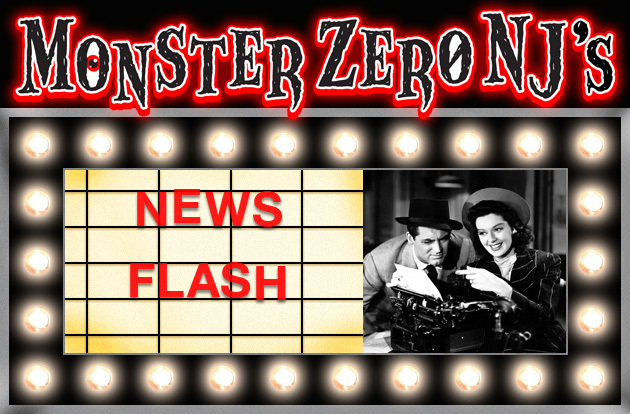 As a huge fan of Flanagan and Carpenter being one of my favorite filmmakers of all time, this is epic news to MonsterZero NJ’s ears! 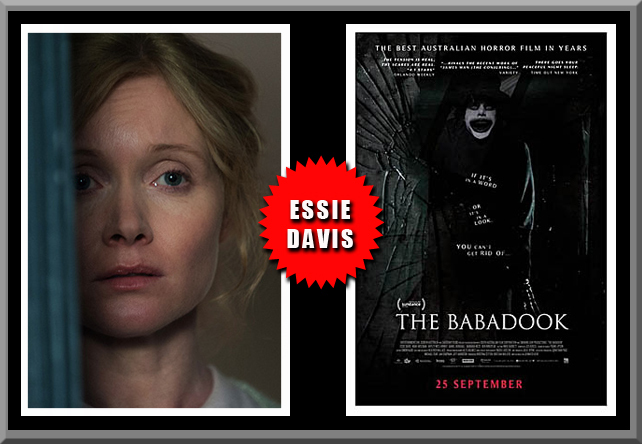 10 PERFORMANCES THAT PROVE WOMEN RULED HORROR IN 2014! 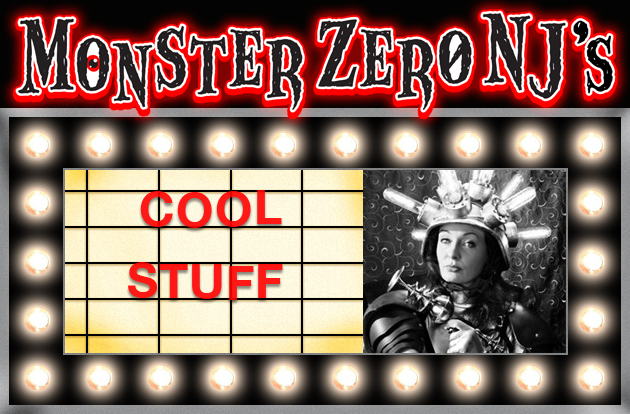 MONSTERZERO NJ’S BEST HORROR FLICKS of 2014! Everyone has their own taste in horror films and everyone’s favorite horror flicks from the past year will vary from fiend to femme fatale. 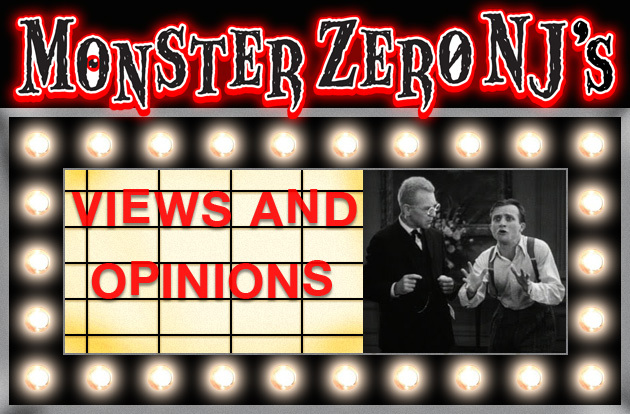 So, with that in mind, here are MonsterZero NJ’s 10 favorite horrors of 2014 along with five honorable mentions that warrant a shout out (scream out?) too! These are 15 favorite… plus one honorary mention… horror flicks from the last 5 years that really grabbed me or entertained me and I re-watch/recommend quite often! I am a big fan of Mike Flanagan’s low budget chiller Absentia so, I was very much looking forward to his next flick which arrives from Blumhouse Productions and is his first big theatrical release. And Mr. Flanagan didn’t disappoint. Supernatural horror starts out introducing us to two siblings, Kaylie (Karen Gillan) and Tim (Brenton Thwaites) Russell. Eleven years ago a horrible incident occurred in their home leaving their mother, Marie (Katee Sackhoff) and father, Alan (Rory Cochrane) dead, with ten year-old Tim incarcerated in an institution. From appearances, Alan murdered his wife and Tim killed him in self defense. It’s over a decade later and Tim has just been released and his older sister has come to help him get back on his feet…and destroy what she claims is the real culprit in their parents’ deaths. After years of treatment Tim sees the murders as a simple case of domestic problems and negative emotions gotten out of control. His father driven to torture and kill their mother and he, forced to defend himself and his sister by killing their dad. A tragic but rational explanation. Kaylie believes it to be the influence of a demonic entity that lives in an antique mirror purchased by their father for his office. While Tim was away, Kaylie has been planning to prove her belief, once and for all, and has tracked down and procured the mirror through her job as an antiques dealer and brought it to their still vacant former home. She convinces Tim to join her on calling out and destroying the sinister force that she believes, from her research, has left a trail of bodies and tortured souls for over 100 years. Is Kaylie delusional and in need of treatment herself, or has Tim’s treatment created a more practical way of rationalizing an even more horrible truth? Director and co-writer (with Jeff Howard) Mike Flanagan crafts an intelligent, inventive and really creepy horror film that certainly has it’s share of out-right scares, especially in it’s last act. But much like his spooky Absentia, Flanagan never bludgeons us over the head with the horror and thus keeps it effective by keeping us from getting numb to it. As with his previous flick, he doesn’t give us everything at once and plays with our heads for a bit as to whether Kaylie is creating a supernatural fantasy to avoid the realities of the domestic horror she witnessed, or is Tim candy-coating the nightmarish truth with the psycho-babble fed him by his doctors? The film is a moderately paced, but has a constantly unnerving and creepy build-up, as the siblings delve deeper into the events that occurred over a decade ago. Flanagan…who also edited…deftly mixes in flashbacks to those horrible events and seamlessly blends them so that at times they all seem to be happening at the same moment and in the same space. It’s really disturbing as we try to figure out if these two are finally reliving and facing what happened, or is there an evil presence in that mirror that is happy to make them experience again the memories that torment them most. It’s in the last act where the full truth is revealed and I will say no more except to be ready for the film to deliver the goods when the time is right. It’s an intense and scary ride Flanagan takes us on to get our answers, made all the more effective due to the skilled and disturbing build-up by a director who makes good on his potential. Again, Flanagan also has an underlying theme about the effects traumatic events have on our lives. With Absentia it was the emotional effects of a missing loved one and not knowing their fate. Here it is growing up and living with the trauma of witnessing domestic abuses and violence. He weaves these into his story subtly so they are not intrusive to the plot, but they are there. And speaking of subtlety, that is one of the things I like about Flanagan’s work and especially with this film, he knows when to be subtle and when to get intense and he does both here to maximum effect. Sometimes less is more and Flanagan’s instincts are good at knowing when to feed us an underlying creepiness and when to outright scare the pants off us. It’s what makes Oculus work so well and made Absentia such a treat. He knows what degree to feed us the films elements and when. He is also clever with his use of the traditional elements so, they appear fresh. The director also gets good work from his cast with Gillan and Sackoff really standing out here with strong performances, but the acting is solid all the way around. No one ever goes over the top, even when the film is in full scare mode, the performances stay grounded and thus more effective. He got good work out of Katie Parker and Courtney Bell (who has a cameo) in his last film and seems to have a knack for writing and directing strong female characters that aren’t stereotypes or caricatures. The film is not perfect, but it’s flaws are very minor and I loved that when the blood does flow, it was practical effects as did a lot of the make-up and effects seem to be. If digital was used, it was excellently rendered so it was not noticeable which, in a film like this, is the way it should be. CGI ghosts and blood are not scary. Overall, I really enjoyed Oculus and how it was equally effective in it’s subtle moments as it was in the more intense ones. It never overloaded you with plot elements or the horror elements and fed you the answers to it’s mysteries gradually so it held your attention till it was ready to let you have it…and the final act does exactly that. A smart, disturbing and sometimes downright scary horror from Mike Flanagan. Also stars Annalise Basso and Garett Ryan as young Kaylie and Tim, respectively and these two youngsters can act. 3 and 1/2 spooky mirrors. 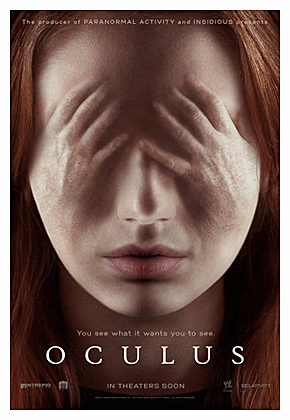 NEW FULL TRAILER for ‘OCULUS’ FROM ‘ABSENTIA’ DIRECTOR MIKE FLANAGAN AND BLUMHOUSE PROD! As I’ve stated, I am a big fan of Mike Flanagan’s spooky low budget chiller Absentia and we now have a full trailer for his next horror feature Oculus which is coming from Blumhouse Productions. Personally, I am looking very forward to this! 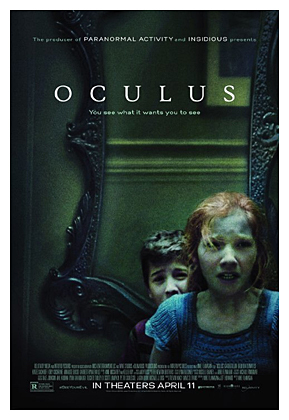 Oculus is slated to arrive in theaters on 4/11/14! Personally, I can’t wait! TEASER TRAILER for OCULUS FROM ABSENTIA DIRECTOR MIKE FLANAGAN! I am a big fan of Mike Flanagan’s spooky low budget chiller Absentia (click on the title for my review) and his sophomore feature Oculus is coming from Blumhouse Productions and looks equally creepy. Film is slated to arrive in theaters on 4/11/14! Personally, I can’t wait!